When the law fails you, The Protectors won’t. Unflappable American Harry Rule, beautiful Brit Contessa di Contini and suave Frenchman Paul Buchet return for another action-packed season of hi-tech sleuthing, international espionage and juicy romance. Based in London, Rome, and Paris, these three super detectives operate a secret agency, jetting around the world hiring out their services to those in need. Employing a variety of specialized skills ranging from expertise in arts and antiques to Judo and Bond-like gadgetry, The Protectors pit their wits against evildoers everywhere. No job is too small or too large for these intrepid heroes--governments are saved, innocent prisoners are sprung, spies are apprehended and glittering, rare jewels are recovered. Starring Robert Vaughn (The Man from U.N.C.L.E.) and filmed on location in some of the most exciting cities around the world, The Protectors is yet another TV cult classic from A&E and the creators of The Secret Service, Thunderbirds, and Space: 1999. 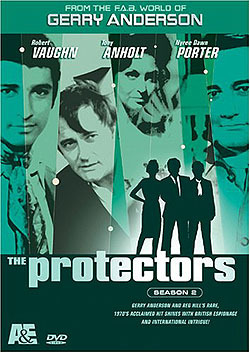 This 4-pack DVD SET features all 26 thrilling episodes from The Protectors popular second season.